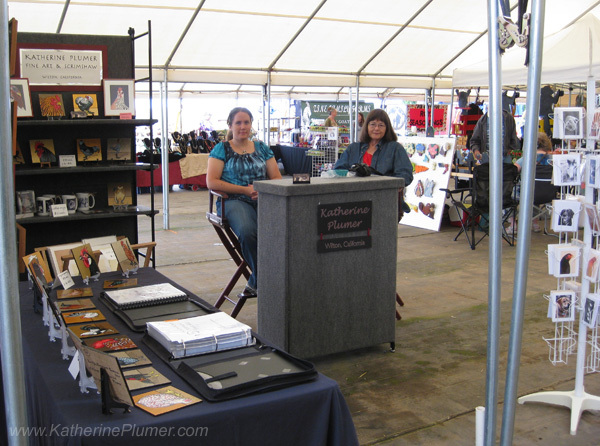 Years ago I swore off ever showing art at a "craft show" or an outdoor venue ever again. Years went past, and my resolve slipped a bit, and I decided to have a booth at the Corn Festival. It was local and easy and didn't require a whole lot of prep work. And I only brought the "cheap stuff" (prints, cards, and old work that is heavily marked down to absurd clearance prices). 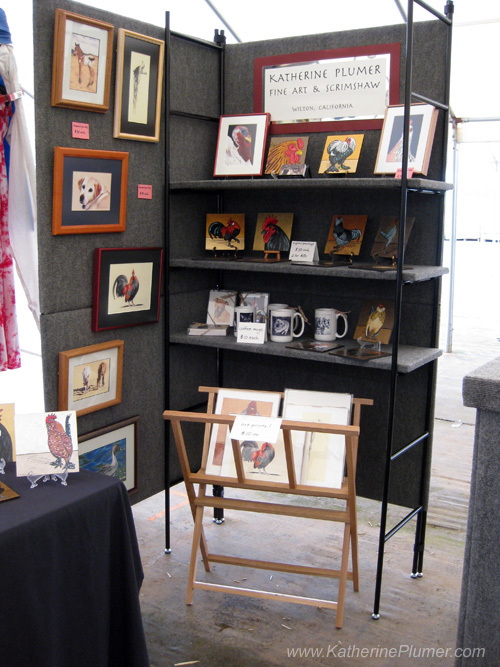 It was a nice festival, please don't think I'm dissing the festival or the people involved, and I'm grateful for the people who came to visit me there and helped pass the time, but I was reminded of the many many many reasons why I chose not to ever show work at craft fairs or outdoor venues. It's a bad fit for an "artist" being in a sea of aprons and pot-holders and insanely cheap garden art, nobody is there looking for fine art! And stuff gets dirty, damp, and things that are made out of paper (like my really nice sign!) warp and now have to be replaced. So yeah, I hereby swear to never again show art at anything that is not an ART SHOW and that doesn't have four solid walls, temperature controls, a roof, and a floor that can be vacuumed! Picky? Yes. Well, one-day partial-outdoor shows might be negotiable, but nothing that requires leaving anything overnight!!! Your work definitely does not belong in a crafts booth. You are an amazing artist and if I had unlimited resources I would buy, buy, bjy from you! I still want to know how you fit all that in the car. Especially the card rack! -BMc. Brigid, that all fit really easily, it's when I take the whole 10x10 booth and a ton of framed stuff that it gets difficult. It goes in the minivan, I just have to swap cars with Mom for the duration of a show! The panels come apart, she shelves fold flat, the card rack breaks down into several pieces.